The eyewall of severe Hurricane Michael is coming onshore right now between Panama City Beach and Port St. Joe. 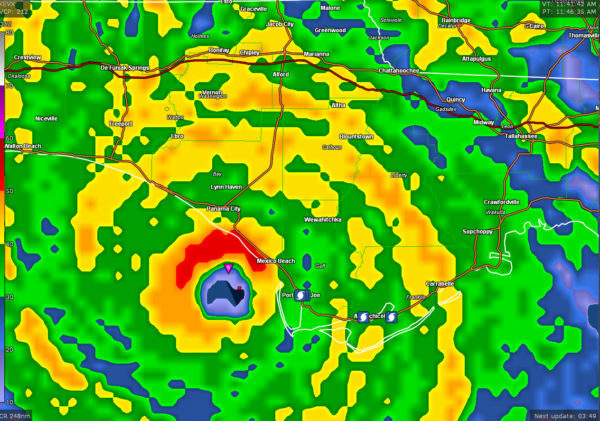 Areas between Tyndall AFB and Mexico Beach may be in the actual eye. On radar the eye is about 14 miles in diameter, so it will last less than an hour. The City of Panama City may go completely through the western eyewall. We were there in May for Tropical Storm Alberto, and I can’t imagine what it must be like to be there now. 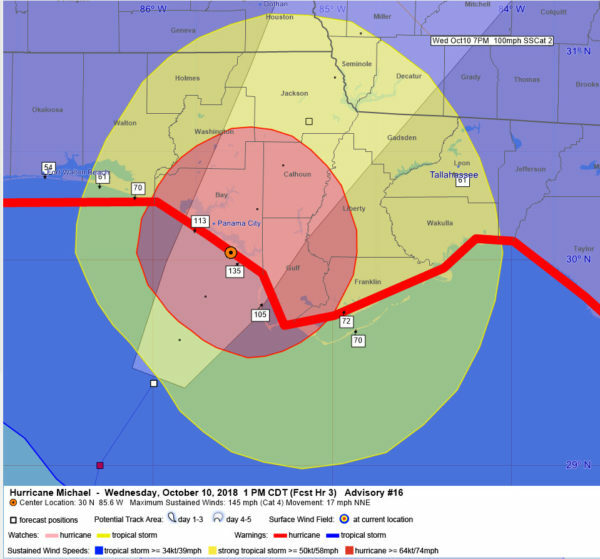 Winds of 135-145 mph will occur between Tyndall AFB and Mexico Beach. Winds of around 115 mph will impact Panama City Beach. The city of Panama City will experience winds of 125 mph. This will cause significant structural damage. The Air Force plane’s last fix showed a central pressure of 922 millibars just before 11 a.m. The Port St. Joe Weather STEM site recorded a wind gust of 106 mph. The Apalachicola Airport just reported a gust of 89 mph. We just got a report from Tyndall AFB, where the barometer was reading 28.63 inches.